There are five Family Science Backpacks with different themes, they’re packed with supplies, activities, and tools for you to explore the world in your backyard, a local park, the forest, the seashore, and even inside your house. Learn how to be a citizen scientist as you identify birds and mammal tracks, and experience how easy it is to get your children interested in science and nature! Available to borrow for one week, see the staff at the Children’s Desk in the main library or our Riverton Branch for more information! Contents include: binoculars, bird call, bird call identification CD, clipboard case, magnifying glass. Available at the Children’s Desk in the main library. 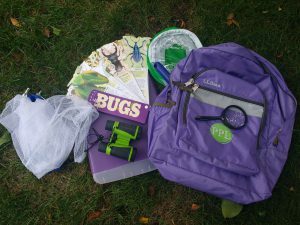 Our Bugs & Butterflies Backpack contains a butterfly net, binoculars, magnifying glass, two way bug viewer, insect habitat, clipboard case. Contents include: butterfly net, binoculars, magnifying glass, two way bug viewer, insect habitat, clipboard case. Available at the Children’s Desk in the main library and our Riverton Location. Contents include: Compass, magnifying glass, binoculars, plant press, head lamp, maps (Peaks Island & Maine’s Southern Coast), clipboard case. Available at the Children’s Desk in the main library and our Riverton Location. Contents include: Sand shovel, gold panning bowl and tweezers, flashlight, goggles, safety glasses & case, children’s rock hammer, archaeology trowel, zip lock baggies (to collect specimens), Golden Guide: Rocks, Gems, Minerals, specimen box, scale of hardness, magnifying glass, clipboard case. Available at the Children’s Desk in the main library and our Riverton Location. Contents include: Binoculars, red beam flashlight, folding star chart, moon map, space blanket, magnifying glass, clipboard case. Available at the Children’s Desk at the Main Branch. Contents include:Aquascope, magnifying glass, pail & shovel, zip lock baggies (to collect specimens), aquatic dip net, binoculars, clipboard case. Available at the Children’s Desk in the main library.